The four-day Event #20: $1,500 No-Limit Hold'em MILLIONAIRE MAKER is officially in the books, and Pablo Mariz has taken the whole thing down, pocketing a staggering $1,221,407 and Canada's first 2017 World Series of Poker gold bracelet. Mariz defeated Dejuante Alexander in just 23 hands, with a faithful and loud rail from the start of the day. 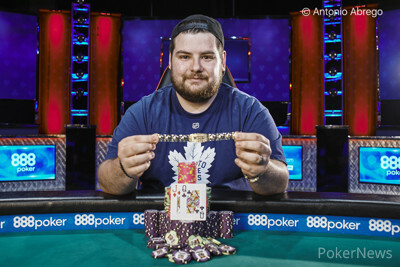 Alexander earned himself $754,499 for his runner-up finish today. The official final table lasted seven and a half hours, and 161 hands before a winner was crowned. This event attracted an impressive 7,761 entries across two starting days, good for the second-biggest Millionaire Maker event since the first once in 2014. A total of 1,165 players made the money, also making this the second-biggest number of payouts awarded in a single tournament in WSOP history. The tournament lasted a total of 39 levels, with the final day concluding in just under 12 hours. "We come here every year, grinding small events hoping to hit something big and we finally did!" 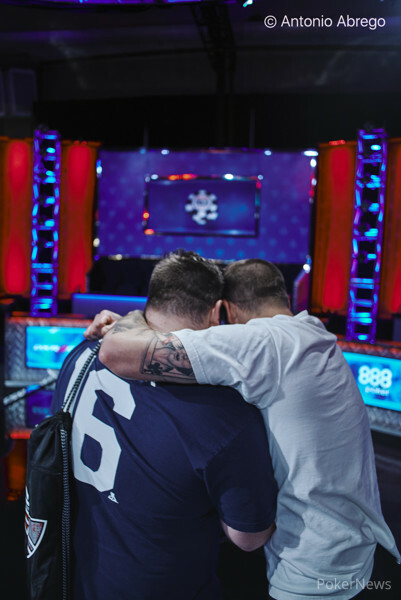 The field was massive, but a ton of familiar faces went deep, including Ralph Perry (12th place - $86,375), Brian Altman (14th place - $68,022), Kenny Hallaert (17th place - $53,962), Jessica Dawley (30th place - $34,718), Matt Affleck (31st place - $34,718), Joe Cada (42nd place - $28,160), Brian Rast (75th place - $13,147), Bertran Grospellier (100th place - $8,054), Frank Kassela (142nd place - $8,054), Dutch Boyd (154th place - $8,054), Humberto Brenes (180th place - $6,948), and David Pham (225th place - $6,948). Hand #161: Dejuante Alexander moved all in on the button for 14,050,000. Pablo Mariz asked for a count and then called. Alexander tabled against Mariz's . The flop came , and Alexander was still out in front. The turn was the which was no help to Mariz. However, the fell on the river, and Mariz jumped up with his hands in the air. He made a pair of queens on the river, winning the title to become the newest millionaire at the 2017 WSOP. Alexander finished in second place and collected an impressive $754,499 for his performance. Hand #159: The pot was limped, and the flop came . Dejuante Alexander bet 1,500,000. Pablo Mariz called, and the fell on the turn. Both players checked, and the came on the river. Again, both players checked, and Mariz tabled a pair of queens to win the hand. Hand #160: Mariz raised to 2,500,000, and Alexander folded his big blind. Hand #154: Dejuante Alexander got a walk. Hand #155: Alexander limped in, and Pablo Mariz checked. The flop came , and both players checked to the turn, which was the . Mariz checked, Alexander bet 1,600,000, and Mariz folded. Hand #156: Mariz raised to 2,500,000, and Alexander called. The flop came , and Alexander checked. Mariz bet 1,700,000, and Alexander folded. Hand #157: Mariz got a walk. Hand #158: Alexander got a walk. 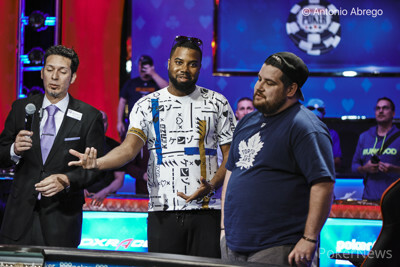 Hand #148: Pablo Mariz raised to 2,000,000, and Dejuante Alexander called. The flop came , and Alexander checked to Mariz, who bet 1,500,000. Alexander called, and the turn card was the . Alexander checked again, and Mariz checked behind. The river was the , and both players checked again. Alexander tabled for two pair and picked up the pot. Hand #149: Alexander called on the button, and Mariz raised to 2,800,000. Alexander called, and the flop came . Both players checked. The turn was the , and Mariz led out for 2,000,000. Alexander called, and the landed on the river. Mariz bet again for 3,200,000, and Alexander laid his hand down. Hand #150: Mariz limped the button and Alexander checked his big blind. The flop brought the and the action was checked to Mariz who bet 1,200,000 to take down the pot. Hand #151: Alexander called on the button, and Mariz checked his option. The flop was , and both players checked to the turn. Again, both players checked, and the river was the . Mariz bet 800,000, which was quickly called by Alexander, who tabled to win the hand. Hand #152: Mariz raised to 2,000,000 from the button, and Alexander called. The flop came , and Mariz bet 2,000,000. Alexander called, and the turn card was the . Mariz made another bet of 5,200,000, and Alexander folded. Hand #153: Alexander raised to 2,000,000 on the button, and Mariz three-bet to 5,800,000. Alexander folded. 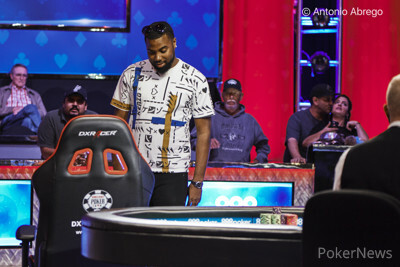 Hand #143: Dejuante Alexander moved all in, and Pablo Mariz folded. Hand #144: Mariz moved all in, and Alexander called for 10,825,000. Alexander was at risk with , and Mariz was ahead with . The flop came , and Mariz was still in the lead with ace-high. The turn was the blank , but the crowd erupted when the hit the river. Alexander doubled up and survived elimination. Hand #145: Alexander raised to 2,100,000, and Mariz called. The flop came and both players checked to the turn, which was the . Both players checked again. The river was the , and Mariz checked. Alexander bet 2,500,000, and Mariz called. Alexander tabled , and Mariz mucked. Hand #146: Alexander got a walk. Hand #147: Mariz got a walk. 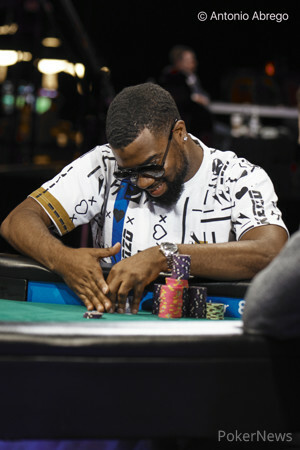 Hand #138: Pablo Mariz limped on the button, and Dejuante Alexander checked the big blind. The flop was , and Alexander bet 1,200,000. Mariz called, and the turn was the . Both players checked, and the came on the river. Again, both players checked, and Alexander took the pot with two pair, tens and jacks. Hand #139: Alexander folded his button. Hand #140: Mariz raised to 1,800,000 on the button, and Alexander folded his big blind. Hand #141: Alexander raised to 4,000,000 on the button, and Mariz moved all in for 24,225,000. Alexander quickly called after he said he misclicked with the opening raise. Alexander was out in front with , and Mariz held . The flop was , and Mariz took the lead with a set of threes. The turn was the , and the river brought the . Mariz got a full double-up and now holds over a four-to-one chip lead. Hand #142: Alexander got a walk. Heads-up play is about to begin, but players are taking a quick five-minute break while tournament officials bring out the WSOP bracelet. "I Think We're On Different Levels"